Blend of extracts of Curcuma longa root, and Moringa oleifera and Murraya koenigii leaves. Formulated to inhibit formation, and promote destruction, of fat cells. 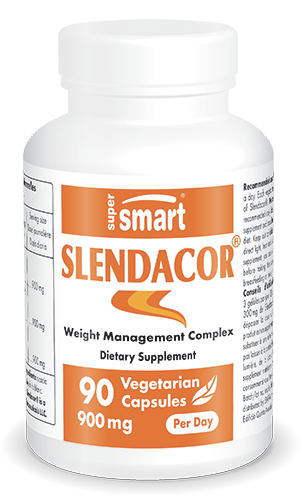 Slendacor® is a new nutritional formulation with clinically proven effects on body composition. ¤ Slendacor® inhibits the formation of adipocytes or fat cells (lipogenesis) and promotes their destruction (lipolysis). In a double-blind study, Slendacor® was shown to stimulate weight loss, reduce body mass index (BMI) and positively impact on levels of cholesterol, triglycerides and adiponectin. The latter is a hormone which governs a number of important metabolic processes including the regulation of blood glucose and the use of fatty acids as energy. ¤ Slendacor® is safe to use and very well-tolerated. The experts who developed Slendacor® at Laila Nutraceuticals in India studied more than 400 ayurvedic herbs to determine which of them inhibited lipogenesis and which promoted lipolysis. The three most powerful (Curcuma longa, Murraya koenigii and Moringa oleifera) were then tested in vitro and in vivo in order to establish the best ratio for maximum efficacy. This optimised formulation was subsequently tested in humans: over 8 weeks, 50 obese subjects took 900mg/day of Slendacor® combined with a diet of 2000 kilocalories/day and 30 minutes of walking. • the treatment was exceptionally well-tolerated. A daily dose of 900mg, taken with meals in three separate doses, was found to produce the best results. Each vegetarian capsule contains 300 mg Slendacor®.